Members of the University of Texas Rio Grande Valley volleyball team applaud along with family members at a mock signing for 7 year old Madisen Flores, sitting far right, at the University of Texas-Rio Grande Valley on Monday, July 2, 2018, in Edinburg. EDINBURG — After getting to know her new UTRGV volleyball teammates, 7-year-old Madisen Flores sat on the hardwood floor of the UTRGV Fieldhouse and had her hair braided by Vaqueros sophomore Jackie Kingsbury. Braiding each other’s hair is one of UTRGV’s regular pregame traditions, and the Vaqueros were quick to get Madisen up to speed. 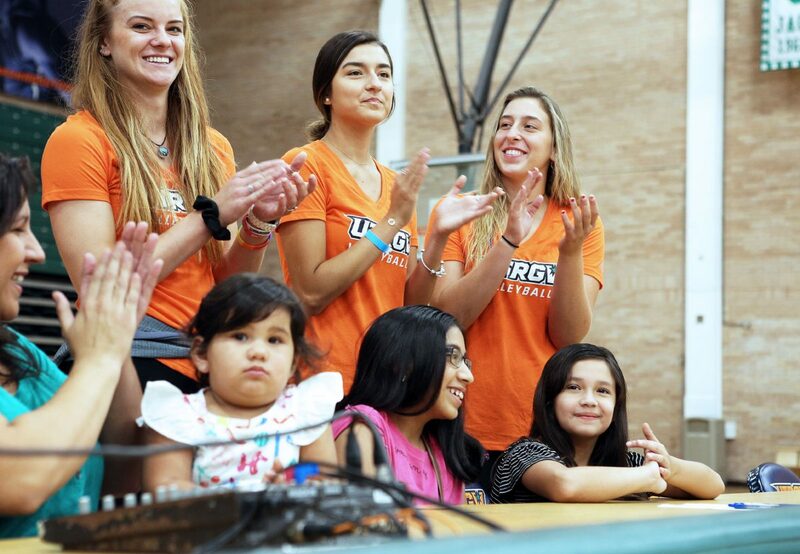 A pediatric cancer survivor from San Juan, Madisen on Monday became part of the UTRGV volleyball program through a ceremonial signing set up with help from the Friends of Jaclyn Foundation. Madisen signed in front of the half-dozen UTRGV players who were on hand for summer classes, plus other department coaches and staff. The players who weren’t on campus sent messages that were shown on the UTRGV Fieldhouse video board. Vaqueros offered greetings from places like Brazil and the Czech Republic, and junior Ragni Steen Knudsen even gave Madisen a look at the scenic waterfront from her home in Norway. Madisen signed at the scorer’s table in front of all the cameras, then she and Alysen were presented with UTRGV volleyball jerseys, which they promptly put on. The girls posed for photos with their new teammates, all the while talking about their favorite foods and music or the many different languages the UTRGV players can speak. Banesa Flores — the girls’ mother and a UTRGV alumni — said Madisen was diagnosed with acute lymphocytic leukemia on Nov. 5, 2015, after the family sought treatment for a fever that wouldn’t go away. Madisen underwent chemotherapy for two and a half years, enduring many days on which she would throw up or feel extremely weak. She was finally pronounced cancer-free in January. Madisen said she is looking forward to attending her first UTRGV volleyball game and has been practicing the sport with a beach ball at the family’s home. Alysen said she was glad to be on hand Monday to help keep her sister from tensing up or becoming shy around her new friends. UTRGV volleyball coach Todd Lowery said he heard about Friends of Jaclyn, a national foundation that has paired more than 750 children with athletics teams, when the organization was featured on HBO’s “Real Sports with Bryant Gumble.” Lowery was contacted by Friends of Jaclyn in May and said he jumped at the opportunity to get involved. Going forward, Lowery said he’d like to see Madisen and Alysen watch matches from the bench, attend team dinners or be a part of the players’ group messages.